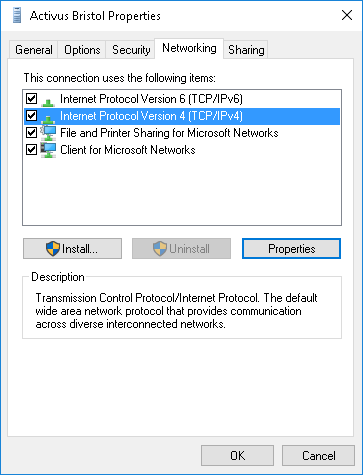 There’s been a few little quirks with Windows 10 that I have noticed or people have reported to me but the most annoying one I’ve encountered so far has been not being able to access the TCP/IPv4 Properties on a PPTP VPN Connection. Setting up a VPN connection on Windows 10 has become a quicker process with less configuration, however when you need to adjust the configuration such as adding a DNS suffix it is not at all simple if you cannot access the properties window for the TCP/IPv4 protocol. Regardless of whether the user is an administrator on the machine or not the properties button is completely unresponsive. If necessary it can be modified in a text editor.